x, 184 leaves : ill. ; 29 cm. Thesis (Ph. D.)--University of Florida, 1990.
some way to make this dissertation a reality. continuing confidence bolstered my determination through difficult times. credibility to the "Sauer grape theory." of the Leesburg, Florida, Agricultural Research and Education Center. Their comments and suggestions are much appreciated. Puerto Rico. Dr. Lewis was unfailing in his endorsement of this project. this dissertation would not have come to fruition. ACKNOWLEDGEMENTS . . . . . . . . . . . LIST OF TABLES . . . . . . . . . . .
ABSTRACT . . . . . . . . . . . . .
1 INTRODUCTION . . . . . . . . .
State of Knowledge . . . . . . . Adaptation in Grapes . . . . . .
Adaptive Pruning . . . . . .
northern latitudes . . . . . . .
by month in Maracaibo, Zulia, Venezuela . . Figure 6 Puerto Rico: proposed viticultural regions . Vieques Island: Mean monthly rainfall . .
to daylength . . . . . . . .
out semiarid areas that are relatively free of cloud cover. transfer the technology elsewhere have been disappointing. soil is everywhere of the same quality, with the same humus content? urban-centered economies (Lewis and Thiele, 1979). most, farmers make use of both modern and traditional techniques. can offer to the discussion of cultural adaptation. Agricultural experiment stations in the tropics are no exceptions. whether or not this is a veil for self-serving chauvinism (Blaut, 1977). 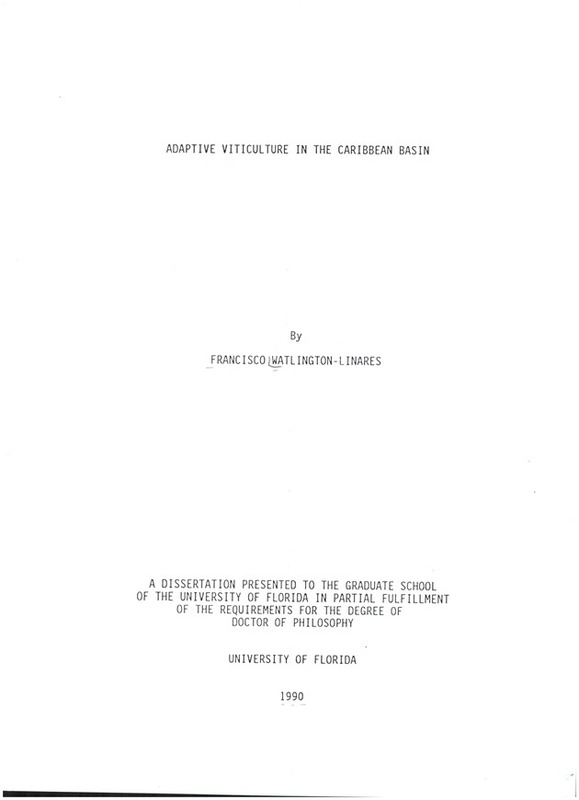 evolution in the Caribbean realm, considered from an "anthropogeographic"
viticultural techniques, and of evolution in grapes as "living artifacts"
broader context of his interest in the New World's agricultural origins. accompanied, if not preceded, the development of permanent settlements. and in behavioral contexts as well, as it is discussed in Chapter 3.
with leading figures of adaptive grape breeding in the Americas. sources and the recording of oral history. (see Chapter 3) as well as directly from the field. Institute, near Barquisimeto). Each visit was for a period of a week. basis, from 1985 to the present. and to elaborate and articulate this dissertation. The cumulative body of research comprised in this work is "grounded"
selection (Campbell, 1965; De Wet and Harlan, 1975). 2. Winkler (1962) was one of the first to challenge the "proprietary"
cooler winegrowing areas of France (Ibid.). cross-disciplinary and cross-cultural, as well as historical. Andalusia, along with the Old World grape cultigen Vitis vinifera L.
Ibero-American tropics and subtropics since the early colonial period. (Thornthwaite, 1943), but unlike them had no special interest in grapes. Japan (Kobayashi et al., 1966), and Australia (Antcliff and May, 1961). (Kobayashi et al., 1967; Kliewer, 1973; Hale and Buttrose, 1974). state of knowledge on photo-phenology. the photo-periodic response. (Vince-Prue, 1975: 80-81). alternating periods of both "favorable" and "unfavorable" daylengths. significant at least to latitude 100 or lower (Figure 1), where V.
Figure 1. Transit of daylength at selected northern latitudes. set and maturation in Old World grapes (Baldwin, 1964; Kliewer,1981). in the tropics by extremely short days and rest-enforcing cold weather. more or less continuous cropping (Corzo, 1987). high latitude cultivars (Sugiura et al., 1975). optimize production of grapes in a particular geographical environment. at different latitudes is a major concern of adaptive viticulture. respond to seasonal changes in daylength stimuli (Vince-Prue, 1975). latitudes must be tolerant of relatively short photo-inductive daylengths. daylengths of twelve or more hours. reproductive cycle is reactivated with the oncoming season's growth. activity, it can prove to be counter-adaptive if done too early (Ibid.). the same manner as date palms (Rueda-Ferrer, 1953). cultivars. Attributing fecundity to male "odor" (pollen?) and "heat"
domesticated, the sterile become fertile, the good much better. the native grapevines are found throughout accounts of the Contact period. bewildering diversity of forms was available in Mexico (Olmo, 1976). with scarce scion-wood from Spanish cultivars (Adams, 1978). A widespread common name for V. caribaea on the mainland is agras. (Adams, 1978). Elsewhere, grapes became dooryard garden plants. that threshold for productive phenology (i.e., flowering and fruiting). virtual banning of the other! paradigmatically entrenched in scientific institutions, can be reconciled. season. Its opposite term, the so-called "chilling requirement,"
is needed to fulfill a required period of dormancy. growing season in higher latitudes. have spread naturally across the equatorial line. (Levadoux, 1956). Well known are the characteristic "Muscats." plant pollen/pollination, or animal (and human) sperm/insemination. insemination, as "echar un polvo," literally: "To (throw a) dust." The original meaning has been lost but the derivation seems clear. of modern pioneers in adaptive grape breeding. observed by Olmo (1970) in an ethnographic context in northwestern India. apparently not been seriously investigated previously. likewise ignored by archaeological researchers of Hispanic agriculture. a cultural staple vital to the social solidarity of the conquistadors. continued in the New World, specifically in early Hispanic Florida. integrated in a new, "mestizo," agricultural complex (Matter, 1973). described the two common native wild grape species, V. aestivalis Michx. and Carolina (Bartram, 1789: p. 49). into the dominant culture of later immigrants. documented survivals from the preceding Spanish period. hybrid V. aestivalis x V. vinifera selections of the "Florida mission"
recognition at the Paris Exposition of 1900.
researcher proposed "indefinite specific limits" (Bailey, 1948). artifact of material culture by means of asexual vegetative propagation. seeds (Euvitis) of extraordinary and uniform appearance (Figure 2). species, V. simpsoni Munson, otherwise known as "Simpson's Grape," and V.
gigAs Fennell, the "Florida Blue Grape." approximately ten times. Drawn by the author. represent a similar hybrid form. other species, namely V. cinerea, V. cordifolia (V. vulpina) and V.
honoring the collector J. H. Simpson of Manatee, Florida (Munson, 1887). Munson eventually downgraded his first simpsoni to V. cinerea var. no. 2216242 in the U.S. National Herbarium (Smithsonian Institution). Fennell described an isolated population of vines which seemed akin to V.
meaty, sweet and tangy pulp. Proclaiming his find a new species: V.
banks of brackish waterways and lagoons" on the Sebastian River, ca. latitude 27*50' N (Fennell, 1940: p. 17). alone the Florida blue grape from some of the natural hybrids of V.
foundling might be a remnant of antique viticulture (Fennel, p.c. 1984). grapes in the vicinity of the hamlet of Mico (an Indian word for chief). to be in the same size category as Simpson's Grape (VS). Newsom (p.c. which averages 16% larger in the VH seeds. comprise 18.36% of their sample). measurement. Curiously, the "median" VG seeds have the largest chalaza. correlation between seed dimensions and number of seeds per berry. width for all VH seeds, however, is 12.30% greater than that for the VG. The mean thickness of the VH is also greater than that of the VG, by 11%. The chalaza is 20% larger in the VH. VG chalaza is 12.4% higher, indicating a relatively elongated outline. living forms with similar seeds, that share horticultural attributes? European V. vinifera, but rather between native American species. have seeds readily discernable as intermediate in form between V.
will have to await more sophisticated techniques of genetic analysis. 1982). The evidence in favor of V. labrusca is at best tenuous. "swarms" or "men~ges" resulting from interbreeding of the "true"
aestivalis with other species, including the introduced European cultigen. of horticultural escapes from early mission vineyards (Branas, 1974). and edible and used for preserves and jelly" (Steyermark, 1963: p.
the Indians had a superior product by present standards. the researcher, and remains an open question. ripe they are of various colors and their juice is sweet and rich. likely encountered a native cultivar, not a wild species. likewise of religious or ceremonial nature should also be considered. months, is supported by archaeologic as well as ethnographic data. and cultural transferal between North America and the Caribbean tropics. ambitious project for developing the foundation of a tropical viticulture. (Prunus persica), appears mainly on senescent leaves (i.e., a "serious"
developed as well as the native V. caribaea, according to Fennell. originated in Florida, a very few from seeds obtained in Costa Rica. daylength as a critical parameter of adaptive viticulture in the tropics. the Brazilian tropics and subtropics over the next quarter century. diverse viticultural industry in Florida (Bates, et al., 1980). territory that has considerable terra incognita. has been used to a limited extent in the Leesburg program (Mortensen, p.c. stimulus diffusion of adaptive hybridization to the New World tropics. Florida cultivars to relatively short tropical daylengths. hybridization (See also: Olmo, 1942; Negral, 1957). Apalaches resettled on the Oconee until 1715. 8. The species are: V. munsoniana, V. rotundifolia, V. aestivalis, V.
experience of viticultural botanists in other parts of the U.S.
1963; Olmo, 1976; Duncan, 1975). documentary sources featuring illustrations of grape seeds. suggestive of both V. shuttleworthi and V. aestivalis. using a "Manostat" dial type 6921 caliper. and Crites (1980), Minnis (1981). tend to be genetically dispersed. noted by this observer and others in some Florida forms of V.
suggests they were ingested in preparation for death. (p.c. 1984) he never took V. jgs or V. smalliana to Costa Rica. exceptional native clone with horticultural attributes. course of two visits to Venezuela, in April 1988 and in November 1989.
hectares reported for 1969, eight years later (Ibid.). geographic areas in which people were striving to establish vineyards. e: MAC, 1969; and Ramirez-Soto, 1976.
disappeared in all but four states. (Tarabana), (Instituto de la Uva, 1988). no more than fifty meters above its coastal periphery (Araujo, p.c. 1988). edge of the Andes in the south (Guevara and Guevara, 1983). April-June and September-November tolda (6/8ths cloud cover). Soure: After Guevara-Diaz, 1985; and MINIDEFENSA, 1984. 1968; Araque, 1969; Melendez and Garassini, 1973). weather and high temperatures combined with high atmospheric humidity. could only be expected to produce small yields of poor quality fruit. to bring in an outside expert. characteristics. He rejected the temperate zone tenet of "heat summation"
funding from CORPOZULIA, the state economic development agency. was established at the state university in Barquisimeto, capital of Lara. Galet (Montpellier, France), and Professor Luis Hidalgo (Madrid, Spain). to a lesser extent from the United States. forefront of research on adaptive tropical viticulture. critical stages in the fruiting cycle with adequate climatic conditions. in the tropics (See Chapter 2). by immigrant growers and modern researchers (Bautista and Vargas, 1980). range, where its perimeter has shifted unceasingly over the centuries. Moreover, relatively high levels of atmospheric humidity prevail. wide varietal differences in tolerance to atmospheric humidity within V.
infestation by various fungus maladies. northeast and higher elevations to the south and west. a crop within dry periods. summation required to complete the crop cycle. (Araque, 1969; Vargas, p.c. 1989). general rule of thumb (Raniery, 1969). December" (Galet, 1973: p. 6). statement of the need to correlate pruning with the phenological cycle. Pruning should be done toward the end of the rainy season, he recommended. pruning to prospective date of harvest should be taken into consideration. would allow two or more crops per year. product is reduced to a manageable index on multiplication by 10-6.
factors such as length of day seem to influence the time of blooming"
must have seemed at once pragmatic and authoritatively "scientific." (1974) gave impetus to the process. region with a growing season as hot and humid as that of Venezuela. 85% of the market in 1972 and were rising despite restrictions. long term viability of viticulture as an economic enterprise. observations in Puerto Rico (See Chapter 5). 4. Zones without limitations for grape cultivation. effective heat (i.e., insolation) is accumulated. November after pruning in June or July. periods of high rainfall the vines should be kept in a "repose"
for a rest period in the pruning calendar becomes functionally adaptive. adapt to short day areas (Fregoni, 1977: p. 27). relatively well adapted cultivars (featuring at least two reputed V.
the short days after pruning in January. an absolute indicator of "daylength inducted productivity" (DIP). relatively short daylengths. Another traditional hothouse variety, A.
Lavallee (also known as Ribier) is third, and Italia, also a "boutique"
quality table grape being somewhat less short day intolerant comes fourth. virtually infertile during the July semester, after pruning in January. Lara (Ibid. ), but which performed irregularly at the trial site in Merida. productive at higher latitudes remains to be determined. informational network linking similar organizations world-wide. the European mainstream of applied viticultural theory. not homologous (Bautista and Vargas, 1981: p. 19). earlier finding concerning semestral differences in fertility. bud formation would take place close to the twelve hour threshold. not a better adaptive strategy than adaptive pruning. of qualitative components of wine must. reference to Zulia, van Balen, 1987). winery was preparing its first vintage for market. effects on V. vinifera, yet have little impact on monthly rainfall totals. totals since 1978 that suggest a conceptual flaw in the Vargas model. June at El Tocuyo, with a peak in May. This is supported by Figure 4. December. In 1980 also, there was a brief near-critical peak in December. the fruiting cycle to be completed under relatively dry conditions. Mean monthly rainfall in El Tocuyo, Lara, Venezuela. Source: According to Vargas, 1978. Source: Instituto de la Uva, El Tocuyo (Lara), Venezuela. 1989. *Only values approximating 75 mm (3 in) or over are presented. All measurements are in millimeters. Approximate equivalent in inches is in parenthesis. and most likely on effective daylength. viticultural boom. With rare exceptions (10), V. labrusca and V.